Between them, they have received 3 ARIA awards (Australian Recording Industry Association) and an incredible 24 ARIA Award nominations. As a duo they have recorded 11 albums with the 12th coming out in 2019. ​They have been touring internationally since 2003, regularly performing throughout Europe, Asia, Australia and the USA, as well as more exotic performances in Brazil, South Africa, India and the Middle East. ‘Their ability to play as if drawing from a shared musical consciousness and their subtle nuances of tempo, bordered on the uncanny’. ​Slava and Leonard are blessed with an uncanny ability to perform so seamlessly as a duo that they play and ‘breath’ as one. Growing up and performing together does not guarantee a symbiotic relationship, but what does create the perfect storm is the mutual respect and admiration the brothers have for each other. Perhaps this is the intangible quality that creates their ability to connect with listeners. 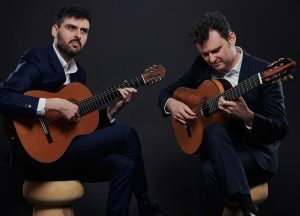 ​Slava & Leonard Grigoryan’s deep appreciation of a broad spectrum of musical styles has resulted in many collaborations involving music, both written and improvised. Combine this with their classical training and the result is a unique sound incorporating all these influences.